Oscar Perez knew death was closing in, but he was still trying to make a deal. For six months, he and a small group of his supporters had been ghosts: The would-be Venezuelan rebels had buzzed Caracas in a stolen helicopter, made off with a cache of government weapons, released blistering statements against the Maduro regime on social media, and given interviews to journalists before melting away again. In January 2018, a small army of Venezuelan security forces caught up to them, surrounding the group in the outskirts of Caracas. Perez posted videos of himself in the middle of the firefight; within hours, he would be dead. His death kicked off a new dispute that has lasted to this day: Did Perez die fighting? Or was he captured and executed by government officials afraid that the former police officer was too dangerous to let live? Former Venezuelan police officer Oscar Perez at an anti-government protest in Caracas on July 13, 2017. Where did Oscar Perez come from? 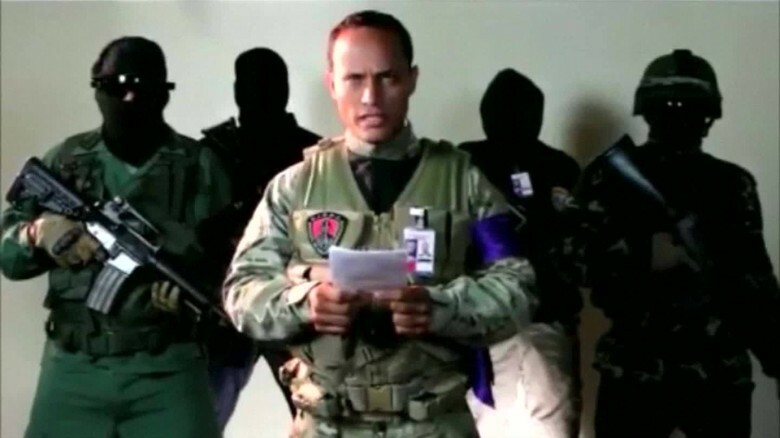 Before he died at age 36, Perez had been a well-respected police instructor, skilled helicopter pilot and actor in a Venezuelan action film, but was not known outside law enforcement circles. That changed on June 2017, when Perez stole a police helicopter and dropped stun grenades over the Supreme Court and Ministry of Interior in the heart of Caracas. He also released a video surrounded by hooded, armed men pledging to overthrow the “tyranny” of Venezuela’s socialist government. “We are carrying out a deployment by air and land with the sole purpose to return the democratic power to the people and to ensure the laws to establish constitutional order,” he said, calling on the Venezuelan military to rise up and overthrow the ruling socialist government. “Venezuela, we shall fight for liberty,” Perez declared. The South American nation’s embattled president Nicolas Maduro described Perez and his supporters as terrorists and vowed to hunt them down. That Perez had come out of seemingly nowhere and had once served in the police made many Venezuelans wonder if his call to revolution was for real. Many thought it was strange that Venezuelan security forces never attempted to shoot down Perez as he circled Caracas in the stolen helicopter, despite reports that Maduro’s government had thousands of Russian surface-to-air missiles. Perez posted a video of himself surrounded by hooded, armed supporters. 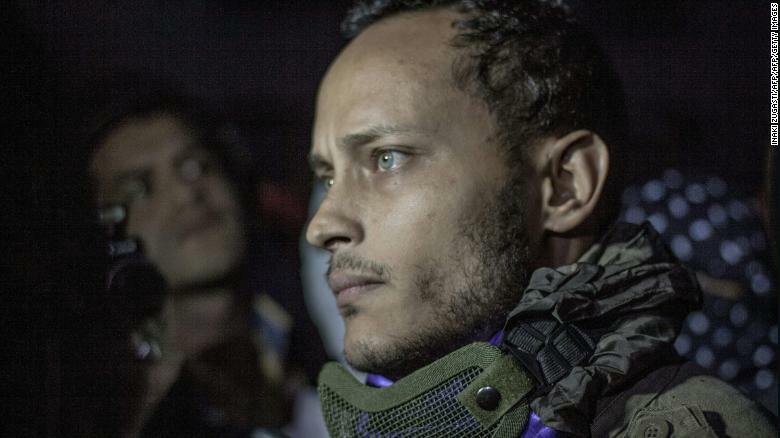 Adding to their suspicion was the fact that Venezuela’s formidable intelligence services-known for their ability to track down government opponents in hiding-seemed unable to find Perez, even as he posted to Instagram and met with journalists. But any doubts about the anti-government group came to end in January 2018, when 500 military, police and paramilitary troops descended on the hilly parish of El Junquito and surrounded the small country house where Perez and his men had been hiding out. Initially Perez seemed to think a deal could be a struck to save his and men’s lives, his social media postings suggest. A video posted on Instagram by Perez showed him talking calmly out the window to an official he referred to as “major,” trying to arrange a surrender. Soon though a firefight broke out with the government forces bombarding the house with machine gun fire and rocket-propelled grenades. The Maduro government says that Perez’s men opened fire, killing two police officers and critically wounding six others. Opposition members said members of colectivos, pro-government paramilitary units, were sent to make sure Perez didn’t leave the house alive. A leader of a colectivo was also killed in the battle, Venezuelan opposition media reported. There is no record of this in the official death toll. In the last video he ever posted, with blood streaming down his face, Perez said the government refused to take him alive. “We are not shooting but they keep attacking,” Perez said. “We are negotiating to turn ourselves over because there are innocent people here, there are civilians but they don’t want us to. “The government has maintained that the everyone in the house was a terrorist. The shootout raged for hours until the house where Perez and his supporters sought refuge was barely standing. Perez, five men and one woman who had been inside the house were killed. The Venezuelan government called the action Operation Gedeon but the battle became known by another name, La Masacre de El Junquito, the Junquito massacre. Now, as relations between the US and Venezuela fray, Perez has been lionized by those trying to force Maduro from power. “Oscar gave his life for the freedom of his people. We all have hope today because of great, great people and patriots like Oscar,” US President Donald Trump said while speaking in Florida in February. A leaked cache of secret photos? Immediately following Perez’s death, rumors began to circulate that he had actually been captured alive, and had been executed by government forces afraid that he would continue to threaten the government from prison. In March, Venezuela’s former Attorney General Luisa Ortega, who has lived in exile in Colombia since breaking with Maduro, said she had obtained proof that Perez had been captured alive and executed. She tweeted two graphic photos, which she said showed Perez’s side and back peppered with gunshot wounds. She claims to possess a trove of more than 300 photos and police documents about the incident, which says she received from sources inside the security forces and Venezuelan government. “Fortunately, some honest men and women who are inside the police forces and are not in agreement with these actions have helped us, they have cooperated so the investigation advances,” Ortega said. Perez’s mother Aminta has confirmed publicly that she believes the images show her son’s body. “The images that circulate today of my son are so the world can see the horror that we live in our country,” she tweeted in March. Reaction over Ortega’s accusations has been split down political lines. Government supporters say that Perez was a terrorist who deserved to die, no matter the circumstances. Members of Venezuela’s opposition, many of whom initially distanced themselves from Perez for using violence, have since embraced him as martyr. In January, Juan Guaido, the National Assembly president who has been recognized as Venezuela’s “Interim President” by more than 50 nations, called for a minute of silence in the National Assembly to mark the first anniversary of Perez’s death. The Venezuelan government did not respond to CNN’s request for comment about whether Perez and his supporters were executed. Protests erupted over the death of Oscar Perez. Ballistic experts consulted by CNN were not able to confirm Ortega’s claim based on the photos she tweeted. Peter Diaczuk and Angelique Corthals of the John Jay College of Criminal Justice in New York said they needed to see more photographs of the bodies to definitively say that Perez and his men were executed. The world may soon get the chance to learn definitively what took place during the gun battle between Perez’s supporters and the government forces. Ortega told CNN she is preparing to send the entire cache of photos and documents to the International Criminal Court in the Hague, to investigate the deaths as possibly extrajudicial killings. 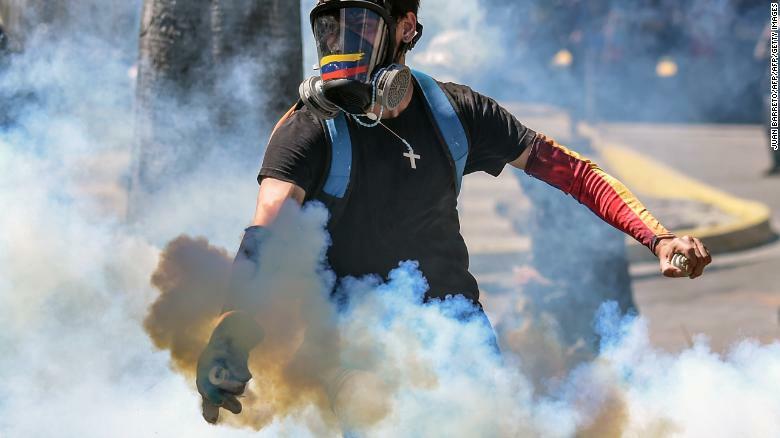 While the ICC has not commented publicly on Perez’s death or Ortega’s accusations, the court is carrying out investigations into alleged human rights abuses by the Venezuelan government.